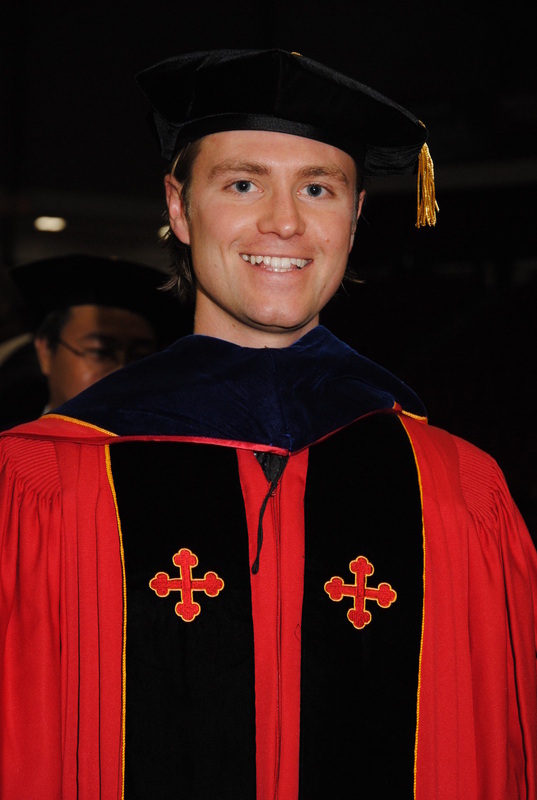 Dr. Brendan Hanrahan received his B.S. degree in Ceramic and Materials Engineering from Clemson University in 2006, and the M.S. and Ph.D. degrees in Materials Science and Engineering from the University of Maryland in 2009 and 2013, respectively. 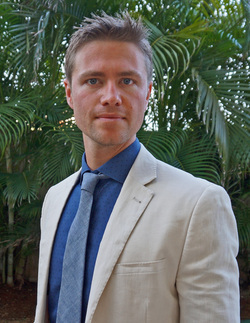 For his Ph.D., Brendan determined the fundamental materials properties dictating the performance of microball bearing platforms, which could serve as enabling technologies for future microsystems. Brendan has been at ARL in the Sensors and Electron Devices Directorate in various positions since 2009. He currently leads an effort in Pyroelectric energy conversion, focused on high cycle frequency and wireless power applications. 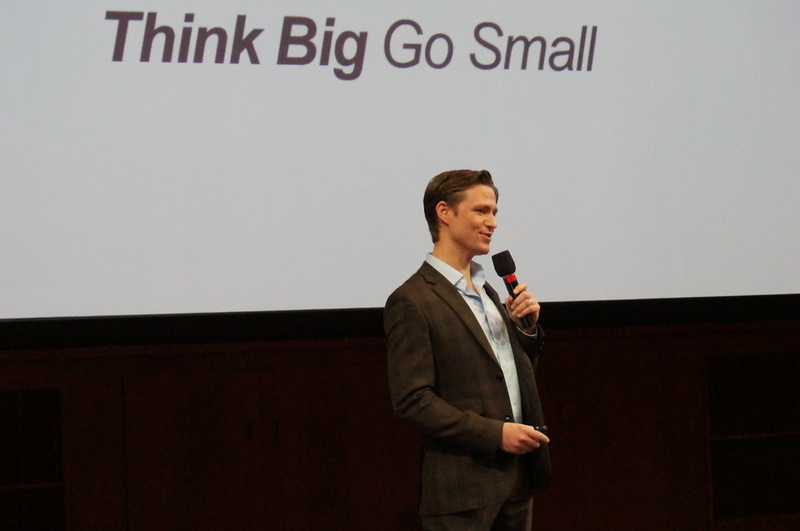 In addition to his engineering efforts, Brendan boot-strapped and currently chairs the non-profit corporation Cupid Charities which runs the world-wide Cupid’s Undie Run event series. To date the organization has fundraised over $14M for the Children’s Tumor Foundation. In 2017 Cupid will be in over 40 cities around the world, bringing us closer to the ultimate goal of curing NF. He is currently serving as the president of the Mid-Atlantic Micro/Nano Alliance, a non-profit dedicated to facilitating regional scientific discussion and collaboration. Sept 2018 - We published a collaborative effort between the Army Research Laboratory, the U.S. Naval Academy, University of Connecticut and University of Maryland on the physics and application of the inverse pyroelectric effect observed in antiferroelectric materials. 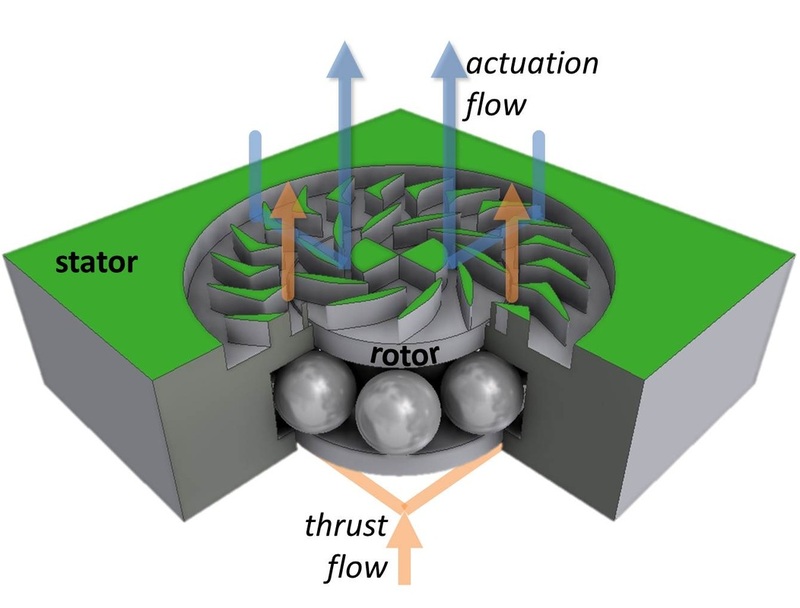 We show that the inverse pyroelectric regime comes from the temperature dependence of the dielectric constant, not anti-polar rotation as previously hypothesized. 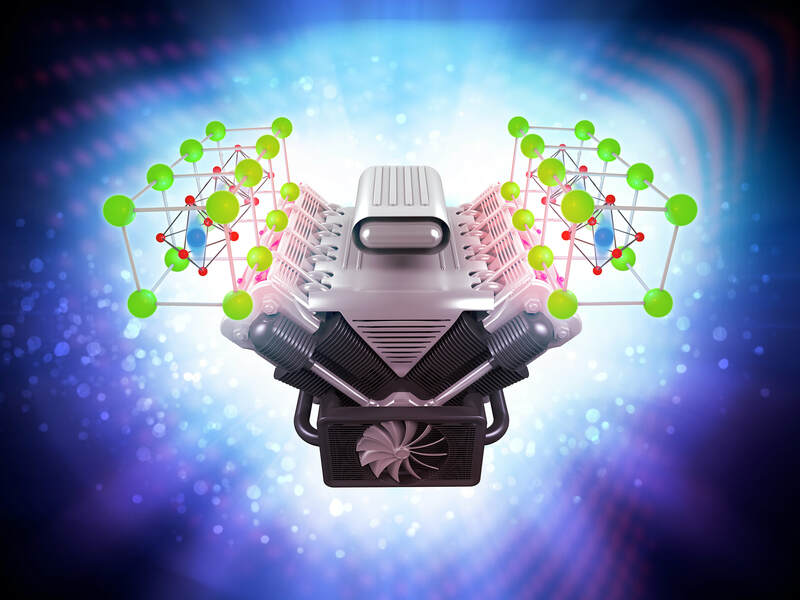 We perform energy conversion in both regimes and then propose a resonant energy conversion circuit that passes charge back-and-forth, analogous to pistons in an engine driving one another. May 2018 - We found that the antireflective Iridium Oxide films developed for wireless pyroelectric applications were also superior catalysts for water splitting. In this paper, we compare IrOx to metallic Iridium and the standard platinum, finding IrOx to be almost universally superior. 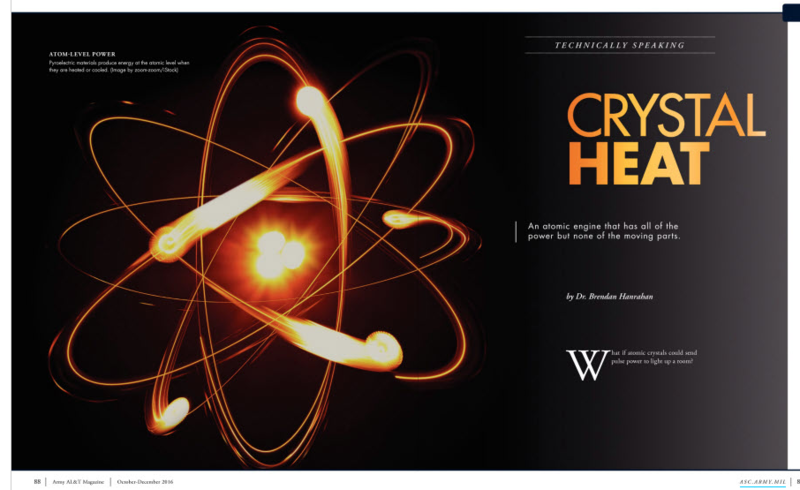 This work could help lead towards efficient hydrogen generation from water. March 2018 - Brendan and his team have published, "Accounting for the Various Contributions to Pyroelectricity in Lead Zirconate Titanate Thin Films" in the Journal of Applied Physics. This was a collaborative effort between the University of Connecticut and the U.S. Naval Academy. The team started with observations that their pyroelectric energy conversion was not behaving as expected. They tracked this difference back to the way the pyroelectric coefficient was being measured. In this work, they compare direct, indirect and theoretical predictions of the pyroelectric coefficient and most importantly, discuss why they are different. This work is important for both civilian and military applications since heating and cooling accounts for more than 48% of home energy use (https://www.energy.gov/energysaver/heat-and-cool). The images on the left show the cooling (purple) taking place in an elastocaloric Nickel Titanium (NiTi) wire. 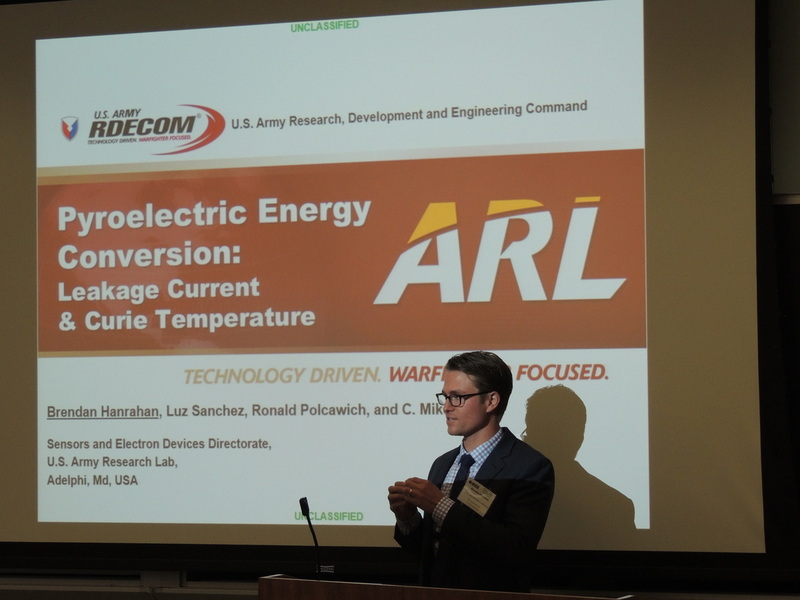 4/19/2017 - The pyroelectric energy conversion team at the U.S. Army Research Lab in collaboration with the U.S. 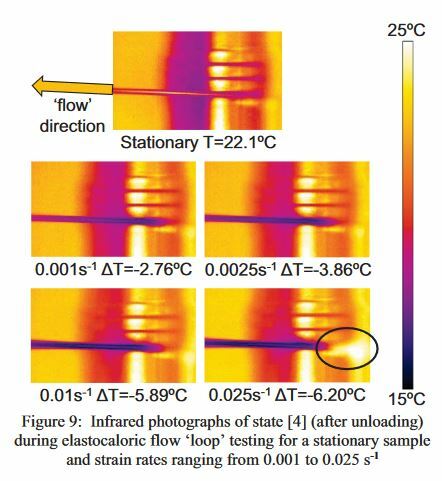 Naval Academy recently published a thermodynamic analysis on energy conversion cycles for thin films. Want more power? push it harder (electrically) and go fast! ​​Long-distance wireless power transmission is enabled by laser-heating a pyroelectric thin film. The modulated laser is synchronized with an applied electric field in order to accomplish energy conversion cycles. 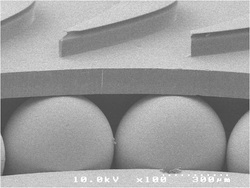 Energy density is found to vary with synchronization while power density is optimized by the trade-off between laser power and the transient thermal properties of the thin film system. 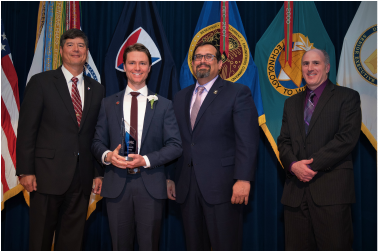 11/22/2016 - Brendan recently received the Community Service award for the Army Research Laboratory for his work with Cupid's Undie Run supporting the Children's Tumor Foundation. 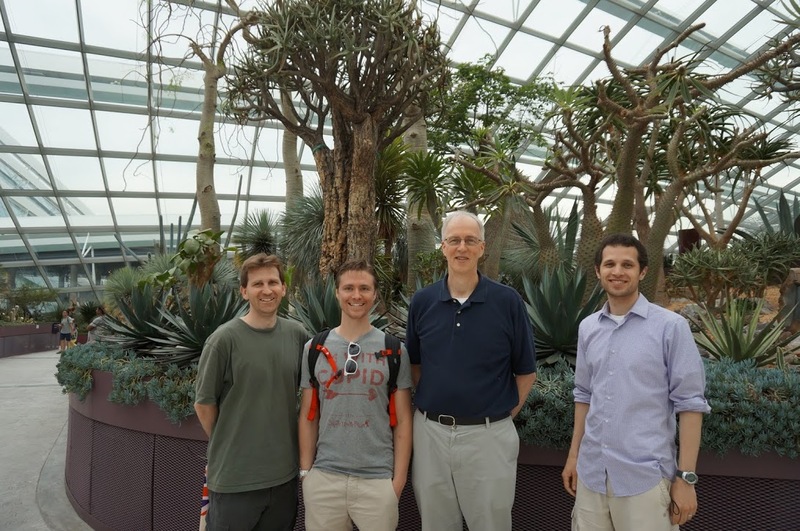 ﻿2/11/2016 - Brendan was recently featured on www.Army.mil for his work both inside the lab and out, "Army engineer known for edgy ideas that raise millions for lifesaving research"
5/27/2015 - The Army Research Laboratory delegation visits the Singapore Botanical Gardens before the International Symposium on Applied Ferroelectrics presentations begin. 2/11/2015 - The abstract "A New Performance Regime for Pyroelectric Conversion Materials" has been accepted at the International Symposium on Applied Ferroelectrics. Brendan will present this work in Singapore in May. 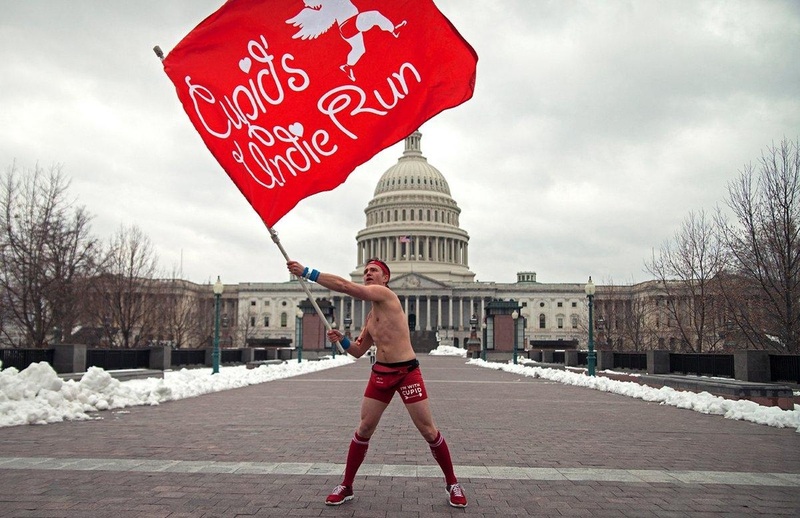 2/09/2015 - Cupid's Undie Run business and founding story is recounted in the Washington Post, "Forget the chocolate and roses. They strip down for charity." 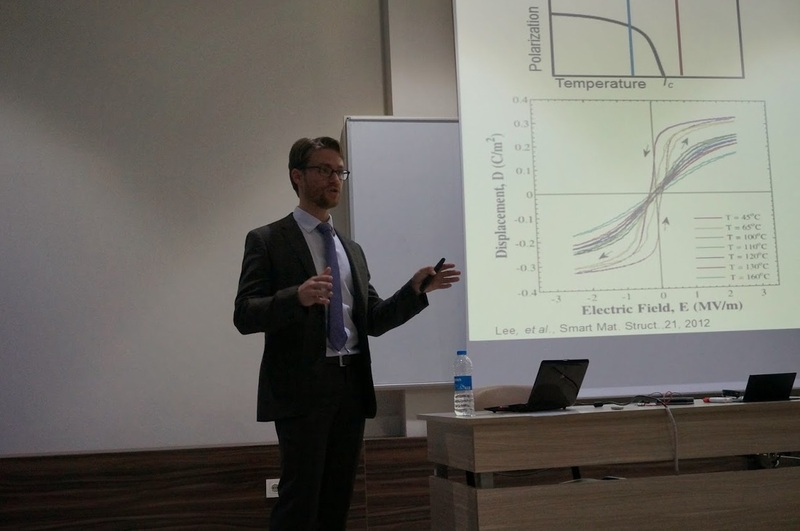 10/17/2014 - Brendan gave an invited talk at Antalya International University in Antalya, Turkey. The talk was titled, "Pyroelectric Energy Conversion: Fundamentals and Applications"
09/09/2014 - "An Adhesion-Dominated Rolling Friction Regime Unique to Micro-scale Ball Bearings" has been published in Tribology Letters, the #1 world-wide journal on friction and wear. 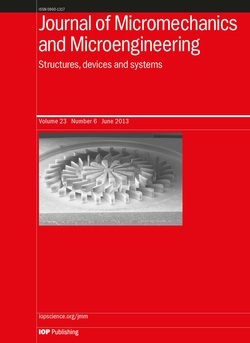 This paper summarizes the most significant discovery from Brendan's PhD thesis, where micro-scale ball bearings are shown to behave fundamentally differently than their large-scale counterparts. 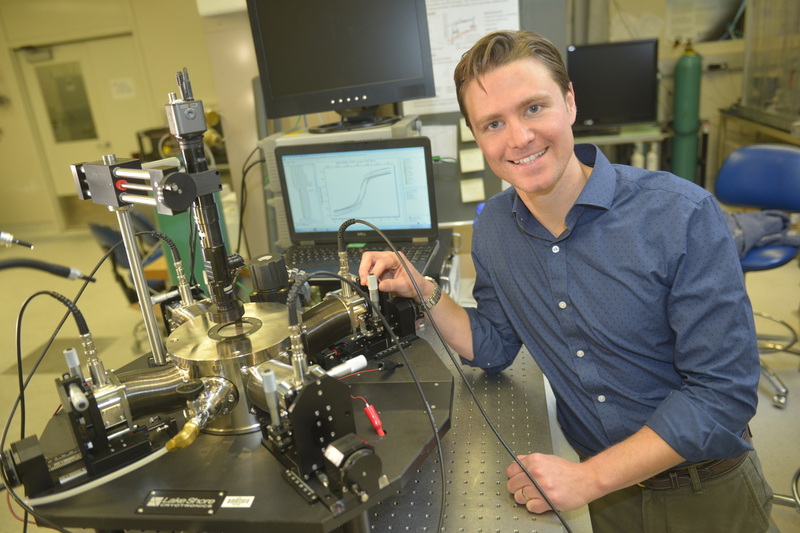 08/13/2014 - "Pyroelectric Energy Conversion: Leakage Current and Curie Temperature" was presented at the 15th International Symposium for Electrets at John's Hopkins University, highlighting Brendan's recent work in portable power systems. Thank you to all of the organizers, volunteers, and runners! 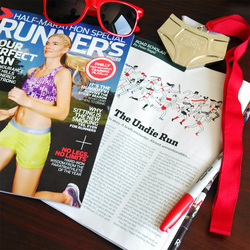 12/17/2013 - CUPID'S UNDIE RUN surpasses $250k ahead of the 2014 event! on track for $3M! 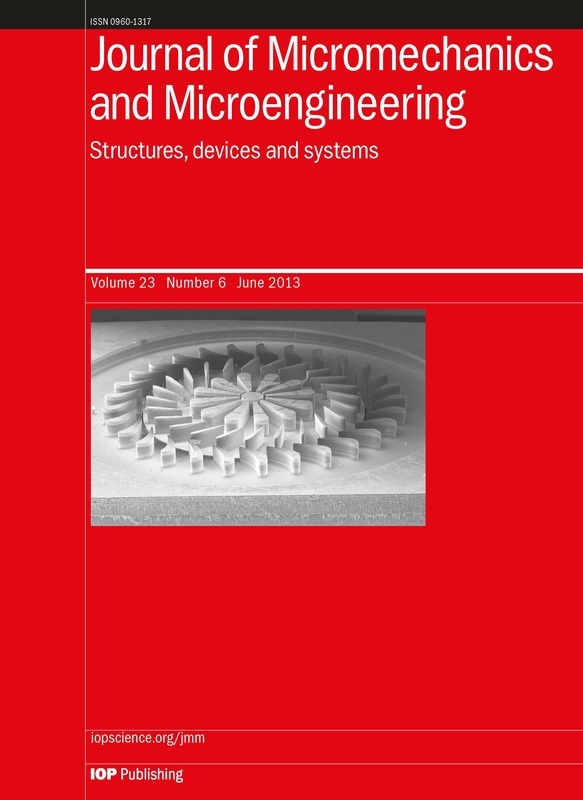 04/18/2013 - The paper entitled "Performance of integrated retainer rings in silicon micro-turbines with thrust style micro-ball bearings" was accepted for publication in the Journal of Micromechanics and Microengineering. 02/15/2013 - Brendan earns his Ph.D. degree after successfully defending his dissertation, "Tribology of Microball Bearing MEMS"
08/16/2012 - Brendan is awarded the silver medal at the U.S. Army Summer Student Symposium for his talk "Microball Bearing Tribology: Enabling High-performance Microsystems"